LaHaye, Tim and Jenkins, Jerry B. The Jesus Chronicles: Mark’s Story. New York, NY: G. P. Putnam’s & Sons, 2008. Pp. 308. As one whose scholarly interests are assuredly Markan, I must admit, the new novel by LaHaye and Jenkins, Mark’s Story, is neither incredibly scholarly or novel. 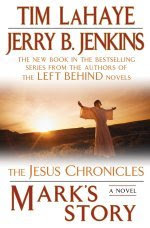 In fact, the Left Behind Guys, in this new addition to “The Jesus Chronicles” series, left me very unimpressed. For starters, one-third of the book is, word-for-word, the Gospel According to Mark plus 1 and 2 Peter, all of which they suggest Mark wrote. Reproducing these sections of Scripture in the book was just unnecessary. Secondly, the story takes a fundamentalistic, narrow approach to reconstructing the man Mark’s life (e.g. maximalism to the max). Now, I realize this is a novel and that as with all novels, some liberties must be taken. However, these two seem to push full steam ahead on every maximalist coal they can find; nothing is ever critically questioned (for a good critique of this view, see the first few pages of Clifton Black’s, Mark as Apostolic Interpreter). Thirdly, they never ever cite any other scholars even though their work is based on maximalist scholarship. Fourthly, the multitude of midrash is almost too much to handle. Okay, so, maybe I’m a little biased. I’m a critical scholar reading this “novel” with a critical eye. But I guess what frustrates me the most is that millions of people will read un-critical works like this and never those that do an awesome job at explaining and bringing Mark to life. Of course, I’m anti Left Behind, so, I was hoping this book would provide a little redemption for the dispensationalist duo. I must say, that did not happen. Honestly, if you “surface read” the Gospel of John and Acts (that is, without any critical or questioning exegetical eye at all) you can get the gist of this book. The only thing I can promote this book for is that it is a stellar example of an uncritical, maximalist historian’s approach to the Gospels. Now, I’m not a minimalist and I’m not against maximalism that is well researched and sturdy. But that is not what we get here. I’m thankful for the review copy but I am sorry that in this review, very little in the way of “positives” can be said.